When someone mentions Pressure Washing, most people think of house washing. Pressure Washing,( we use the term "cleaning", because most anybody can "power wash", but "pressure cleaning" is an advanced, more through cleaning), has evolved into an accepted method of not just house washing but exterior cosmetic cleaning in general. In the residential industry pressure cleaning is used to strip paint and stains from log homes, decks and other wooden surfaces. Also, vinyl siding, brick, driveways, patios, fences, and retaining walls can be cleaned to remove dirt, mildew and other contaminants. Properly used, awnings and canopys can be cleaned with excellent results. In the commercial industry, pressure cleaning is used to clean store fronts, restaurant exhaust hoods, vents, dumpster pads, drive thrus and sidewalks. It is also used in transportation fleets to remove road grime, salts and other pollutants. 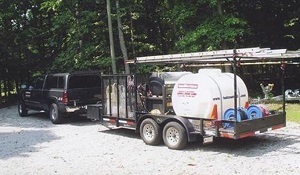 Taskmasters offers full service pressure cleaning tailored to meet each individual need. Be it a one time cleaning or scheduled maintenance, we work with our Raleigh customer to provide the best cleaning program possible. If you're looking for a professional pressure washing contractor in Raleigh, North Carolina, then give us a call 252-266-9457 or complete our online request form.